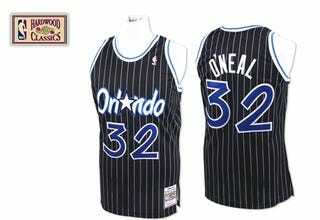 Mitchell & Ness, purveyors of vintage jerseys, are now selling the O'Neal 94-95 jersey as part of their Hardwood Classics series. It would be one thing if it were Shaq's rookie jersey, but when he donned this "classic," O'Neal had already played two full years in the league. This should still be in closets, not a throwback jersey. That's just wrong. Mitchell & Ness should only be allowed to sell St. Louis, Kansas City, and maybe Seattle jerseys — basically, anywhere that doesn't have a team anymore. They definitely shouldn't be allowed to sell jerseys of players who are still playing. It just occurred to me there are thousands of people reading this site who are still in college, and as a result, don't remember Shaquille O'Neal playing for Orlando. God, I hate you all.